This is where it all begins: the sketchbook. I've made some quick doodles about the main events in the story. As you can see, it's a story about a little elephant, but that's all I'm saying for now. But it is a huge challenge, because the process is totally new for me. Questions such as 'Where to start?' and 'How do I make text and illustrations work together?' arise. I have decided to make a checklist for myself to have a good oversight over everything that still has to be done. 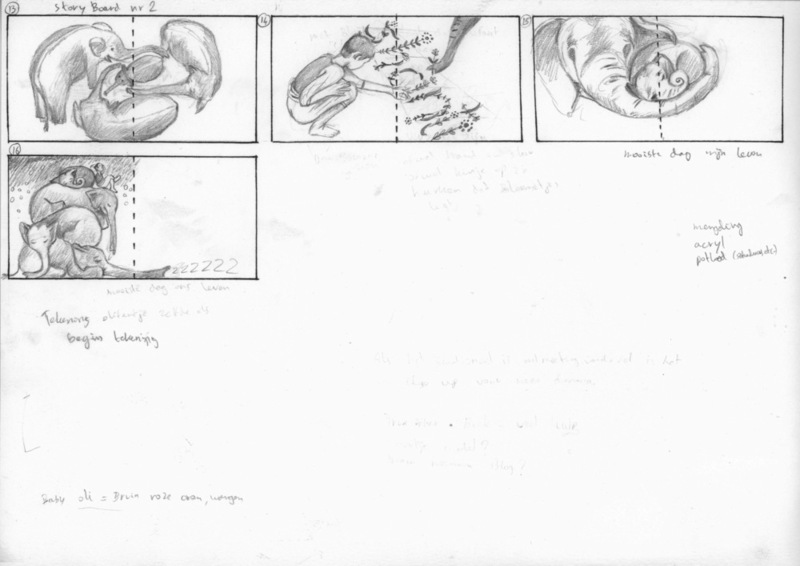 I have made some storyboards already. This is the second one. This little guy is one of the main characters, I've based him on Kims beautiful son. I had never drawn much elephants before, so I'm happy with the beautiful picture book Kim has lent me, it has plenty of elephants in it. And the children's book with illustrations from Carl Cneut is a nice inspiration too.